If you like stylish designer fashion Velvet Blazers, dinner jackets and sport jackets and wearing them with exclusive designed Mezlan Shoes, David Eden Shoes and Alligator Shoes, you're going to appreciate the fashion style paisley blazers and stylish fashion inspired dinner jackets you find on ContempoSuits.com with our collection of Stacy Adams Shoes. 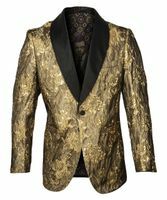 Designer Mens Velvet blazers and dinner jackets for men are a fashion statement and a reflection of fancy blazer style that is perfect for the evening with their warm cozy velvet fabric that just looks great any way you wear it when you go out at night. 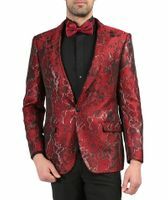 You will also appreciate our huge selection of stylish stage fashion and fancy performer dinner jackets and tuxedo style velvet blazers that are all about fashion from the latest blazer designers that are exquisite in nature and perfect for getting noticed. Featuring fine velvet or stylish fancy shiny fabrics like satin and even fancy paisley patterns that are all about the night life and what wearing a fashion blazer is all about. Need some great looking Cheap Suits in all types of styles, find them fast. Bring out the party in you with fashion blazers designed for party time. Dressing to turn heads is always fun and easy when you start wearing fashion blazers with attitude and adding some fun to your fashion arsenal. You'll find unique pattern blazer like paisley and sequin all designed for getting noticed. Mens classic blazer jackets feature both single breasted classic styles and double breasted blazers in a classic regular fit. You'll have a choice of classy style brass button blazers as well as matching color painted button blazers available in many colors to fit your situation. Make things happen when you go out wearing a paisley blazer. Paisley pattern blazers have the night time look and attitude that just makes your style come alive. You'll find plenty of colors and styles of paisley blazers ready to make night time the right time. Manzini blazers represent style that reflects the philosophy for the man who wants to be in the spotlight. You'll find these Italian designed fashion blazers are perfect for Entertainers and Celebrities who love having all eyes on them with their unique style fabrics that won't be seen everywhere. If you love your velvet blazers and dinner jackets in the fall and winter, you'll love the selection of styles as well as fashion colors that Contempo Suits offers. Shop velvet blazers and jackets from Vinci, Sorento, Manzini and Inserch all for the fashion minded man. If you like wearing mens dinner jackets and like to wear them with style, you'll find the selection and colors of dinner jackets to your liking. These aren't your run of the mill styles but are dinner jackets that are perfect for the man who refuses to blend in. 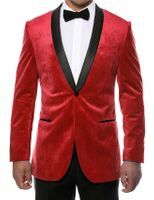 If you're an entertainer or stage performer, you are going to love these fancy style dinner jackets. Empire Tuxedo Blazers and Jackets reflect the fast paced life style for the man loves the night life and knows how to own it. These Tuxedo blazers feature the cutting edge style that you see the Actors wear on the show Empire. If you are a grown man who favors style in his sport jackets and fashion blazers, let Inserch show you the way to compliments and sophistication. Inserch sport jackets featuring Italian design and are made of the latest fabrics that reflect fashion and style for the grown man who dresses to impress. EJ Samuel Blazers reflect the same attitude and fashion forward philosophy as their eye catching suits. These mens blazers combine both attractive looking patterns and fabric combinations with bold colors all designed for the man who refuses to blend in. These are blazers with a mission. Fancy Suit Jackets that are made of velvet or paisley that are known as Mens Blazers and dinner jackets have a magical fashion power about them. What do I mean? Well let's say that you take a man wearing a just a simple shirt and a pair of jeans, well he looks just ordinary and not well dressed. Take that same man and just put a fancy velvet suit jacket or designer fashion Paisley blazer on him and he will immediately transform into someone stylish in a blink of an eye. A designer fashion blazer or dinner jacket designed for men whether they are made of velvet or stylish paisley fabric have always been the top of the food chain when it comes to Mens casual dress clothes like no other apparel item available. Mens Velvet Blazers and dinner jackets are the New Must Have Fashion Suit Jacket for the fashionable well dressed man. You may already have some men's sport coats in your wardrobe but you will really spice up your mens blazer collection with a Fashionable Velvet mens suit jacket in a way that you can't by not wearing one. The stylish velvet Suit Jacket and dinner jacket has a certain transformation fashion power which is the great thing with Mens Velvet Blazers and why you can dress them up with slacks or dress them down with jeans. Velvet for a blazer choice is always such a versatile fashion minded fabric for the colder months that it always makes a stylish choice when it's fashioned into a fancy paisley blazer. If you need something a bit more formal, we also carry dinner jackets made of paisley, sequin or velvet as well. A dinner jacket is one of the most sophisticated looks that you can wear when the time is right. When the Club is calling you. You'll need some Antonio Zengara Shoes Here.